Given the centrality of Africa to Italy's national identity, a thorough study of Italian colonial history and culture has been long overdue. Two important developments, the growth of postcolonial studies and the controversy surrounding immigration from Africa to the Italian peninsula, have made it clear that the discussion of Italy's colonial past is essential to any understanding of the history and construction of the nation. 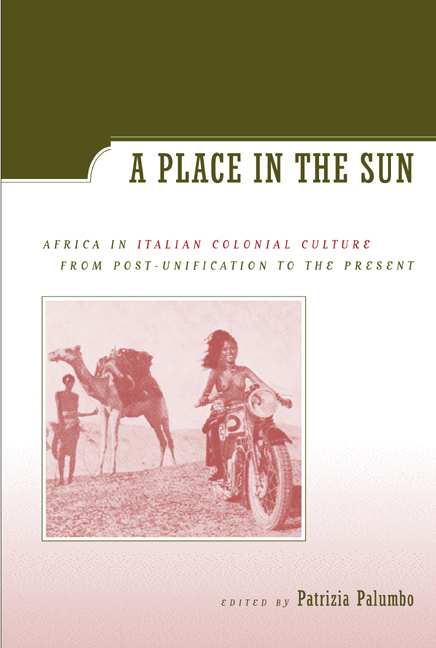 This collection, the first to gather articles by the most-respected scholars in Italian colonial studies, highlights the ways in which colonial discourse has pervaded Italian culture from the post-unification period to the present. During the Risorgimento, Africa was invoked as a limb of a proudly resuscitated Imperial Rome. During the Fascist era, imperialistic politics were crucial in shaping both domestic and international perceptions of the Italian nation. These contributors offer compelling essays on decolonization, exoticism, fascist and liberal politics, anthropology, and historiography, not to mention popular literature, feminist studies, cinema, and children's literature. Because the Italian colonial past has had huge repercussions, not only in Italy and in the former colonies but also in other countries not directly involved, scholars in many areas will welcome this broad and insightful panorama of Italian colonial culture. Patrizia Palumbo is Assistant Professor of Italian and French at Wagner College.